This fall ushered in a new start for both boys. Will, 5, entered the big world of public school by becoming…....drum roll...................a Kindergartner. I must confess that Kindergarten is a word I cannot spell easily and it may take me all year to get it right without the help of spell check. 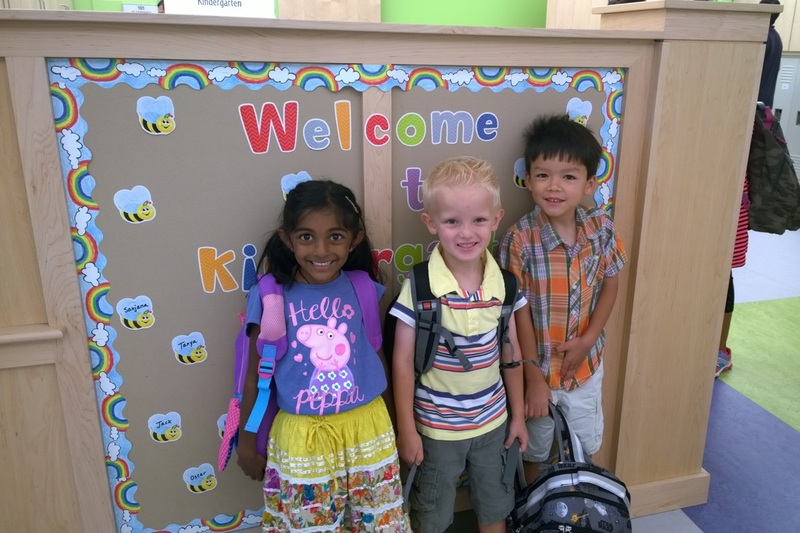 Will with 2 pre-school buddies on day 1! Checking out the new classroom. 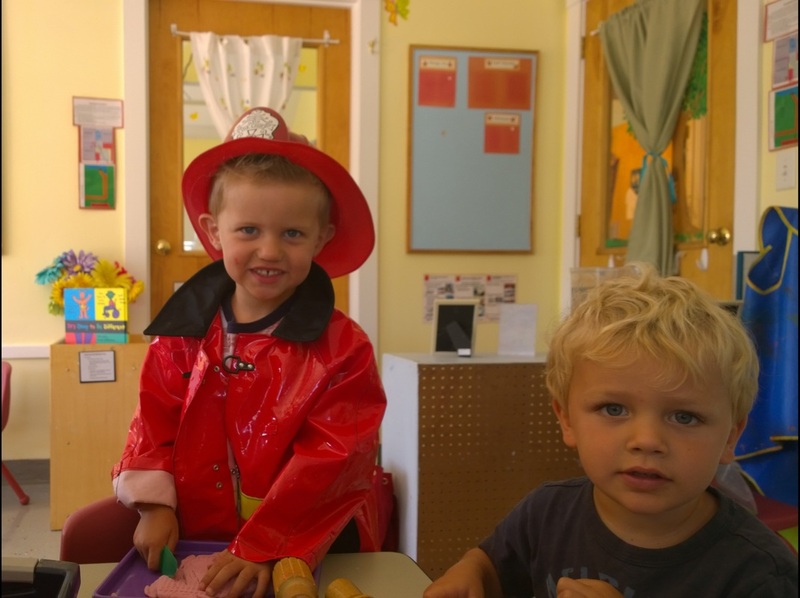 Matty, 3, also started at new pre-school. We were lucky to get a spot in one of “those pre-schools” that carries a name and has a reputation which seems to imply your child will have this amazing advantage over the other children (like Will) who only went to a regular pre-school that was really more of a daycare for poor parents like me who work (long sentence I know – but it makes the point). A weepy mommy on day 1 of Kindergarten. As we looked to the fall we did all the “prep” that was available to us. We visited schools, met teachers, Matty’s new teacher even came to the house to “hang” and meet him. We tried to normalize this transition for both as best as possible. I have to admit I was more nervous about Will starting at Kindergarten (hey I got it right first try!). Starting the new school meant not being in the same school as his best friend. I was concerned he would be sad and not feel good about going. I was further concerned when I learned that he (of course) was assigned to classroom of the teacher who was expecting and due on September 10th. Bad enough starting a new school, but how does a 5-year-old feel comfortable in his new school with a new teacher who quickly leaves and another new teacher who starts only a week later??? In the end he was lucky to know a few other students also entering K in his school, and good friend ended up in his classroom. Also a bonus - teacher #1 went into labor before school started so he only knows teacher #2. We can deal with the switch back to #1 later – that’s if she returns…..
Matty on the other hand was an unexpected and different story. I was so excited for him to be at his new school. They have a tremendous focus on language (he is a great talker) and arts (what kid doesn’t like to get dirty with paint), not to mention a playground area that is 3 times that of his old school. We even made sure that he was in the same class as a good friend. But as the saying goes…The best made plans…. let's just say he was not happy. Matty thought of himself as the Mayor of his old school, but I wasn’t crazy about the pre-school classes they offered so I decided to switch. When I looked into the “fancy school” last spring I seemed to miss one important component – at least two-thirds of the kids go home after lunch. I had signed Matty up until 4:30 thinking that most days we’d grab him by 3:30 but left some wiggle room just in case. The first 2 weeks of school only he and another girl were in the “afternoon arts program”. 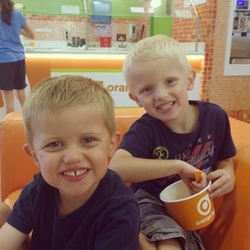 Two other boys who were also going to be there were off enjoying an extended summer vacation with their family and would be joining in a few weeks – but a 3 year old doesn’t get that. He thought he was stuck at school with no one to play with. Matty was pissed. 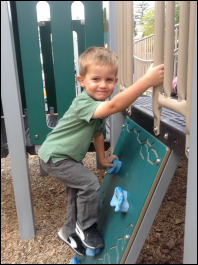 For the first 6 weeks he has been resistant to playing with the other children or even participating in any activities outside of the classroom. He even cried on one “open door day” where he was allowed to explore the classroom adjacent to his to check out their toys. He shared that he didn’t like the afternoon teacher and wasn’t interested in making new friends. I am happy to share that now – two months later – we are finally playing with more then our one friend, and we are even tolerating the afternoon teacher. I must admit a slight feeling of guilt at creating this situation for him. In retrospect, I’m somewhat ticked at the school for not being more clear about the daily exodus and at myself for not asking better questions. Would I have chosen differently? I don’t know, but at least he could have been prepared and maybe those first few weeks we could have picked him up earlier. I think (hope) in the long run he will be stronger and better able to manage transitions and frustrations. I guess we will find out fall of 2017 when he starts Kindergarten. Lesson learned. A new attitude for our new beginnings.